This is the 1908 Railway Clearing House map of the railways around Caerphilly. Penrhos junctions are a couple of miles west of Caerphilly. 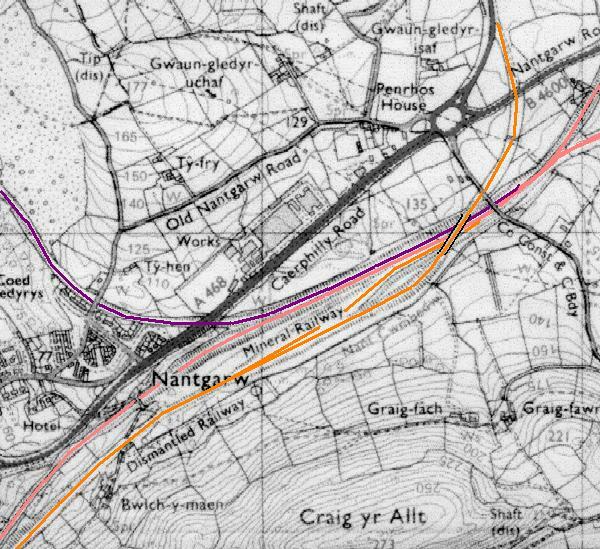 The map does not show that the junction of the Rhymney railway branches to Beddau Loop junction and Watford Crossing junction was actually called Caerphilly Branch junction. 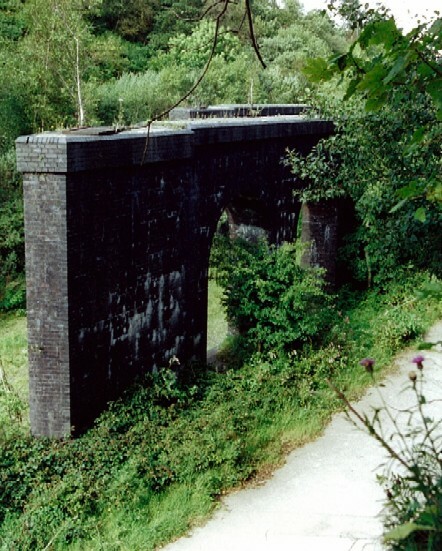 The first railway through Penrhos was the Rhymney who built a single line from there first Caerphilly station (near Aber junct.) to the Taff Vale Rly at Taff's Well. 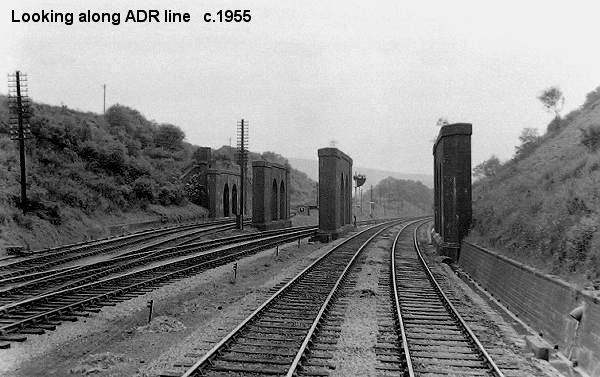 The second railway was the Alexandra (Newport & South Wales) Docks & Rly, then called the Pontypridd, Caerphilly & Newport Rly, which aptly describes its route. Finally came the Barry Rly. First with its Rhymney extension to Penrhos Upper Junction. Then later from Penrhos Lower junction across to Barry junction of the Breacon & Merthyr railway. This is the 1:25000 ordnance survey map of the are around Penrhos junctions. I have super imposed the routes of the old railway lines in the same colours as used in the previous map. In the upper right of the map can be seen Penrhos House, which gives its name to the junctions. The original Rhymney line takes the only possible route from the Rhymney valley to the Taff valley. Even then it was not an easy route, with a ruling gradient of 1 in 47. (c) National Library of Wales, Aberystwyth, WDJ coll. This the oldest photograph I have found of Penrhos. It dates from 1935. It is one of a series of three that were taken from the newly opened GWR signalbox. By this date the viaduct, although still standing, was not being used. 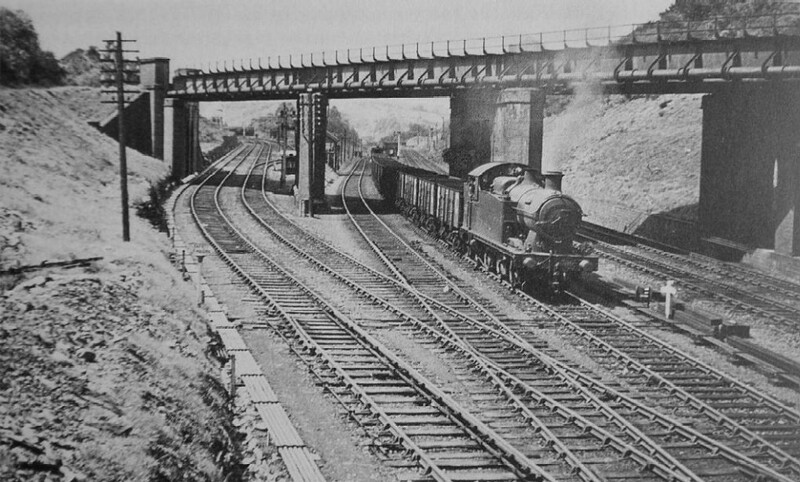 The GWR had closed the Breacon and Merthyr extension of the Barry railway in 1924. 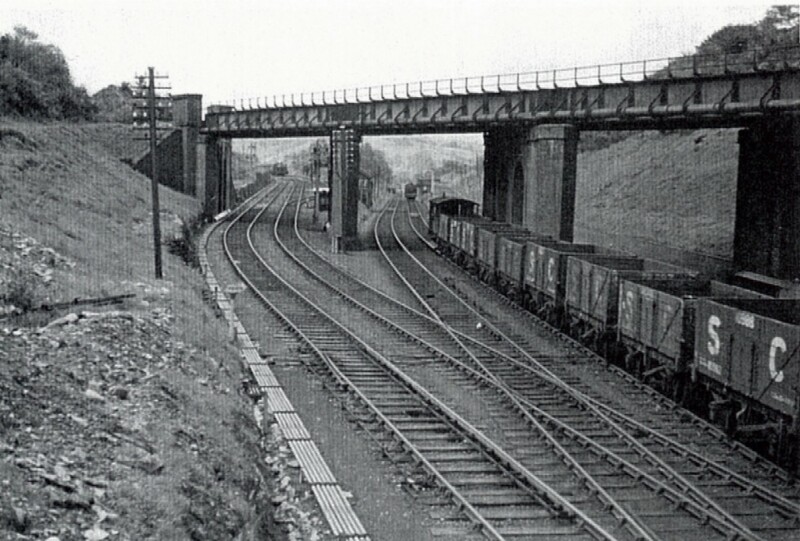 In 1928 the GWR doubled the track down 'Big Hill' (as the line from Penrhos to Taffs Well was known) to Taffs Well, and this route was then used to carry much of the Rhymney valley coal to the docks via the Roath branch. This was done to reduce congestion around the Queen St, Cardiff area. Taken a minute or so after the previous photo, shows the rear of the train and banking engine that has stopped at the top of the steep 1 in 47 section of the bank. The gradient of the track in the foreground being a mere 1 in 83! The more I look at this photo the more I'm wondering if the banker has stopped at a water tank to take water? The Big Hill bankers joined the train just after Taff Wells Junction, where the train waited for the banker to join at the rear before starting again up the hill. Visible in the ditance behind the left hand viaduct pier is the old Rhymney Penrhos South Junction signal box. Completely hidden by the pier is the old Barry Penrhos Sidings North signal box. These two signal boxes had just been made redundant by the GWR Penrhos Junctions signal box from which this photo was taken. Also visible in the distance is a train just appearing from the ex Barry exchange sidings on the left. Also from 1935, looking in the other direction. 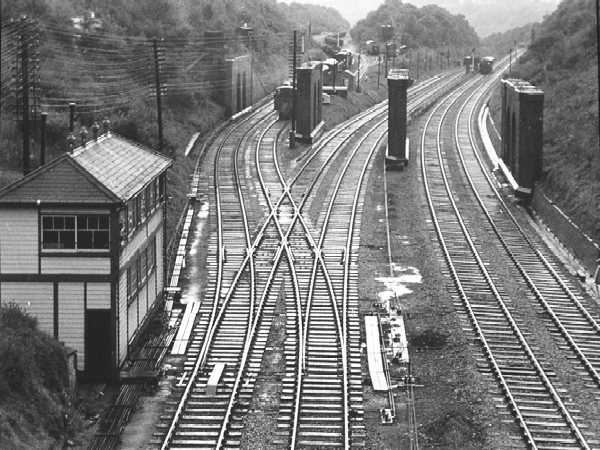 In the distant middle can be seen redundant Rhymney Penrhos North Signal Box and the junction. 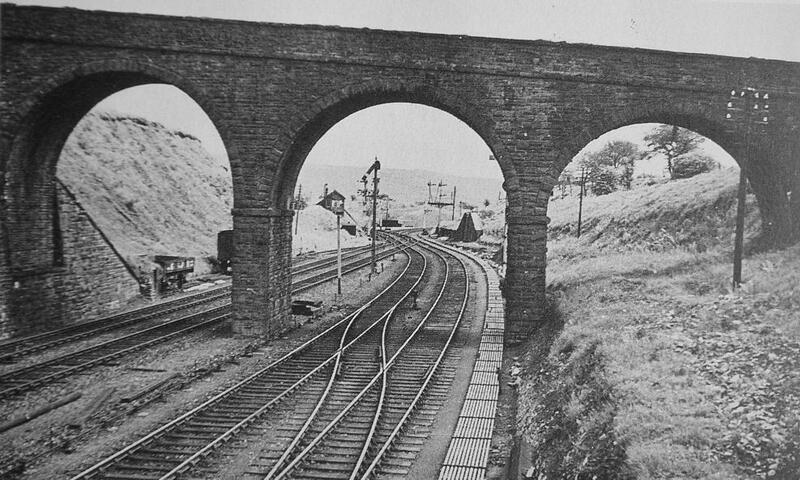 In 1937 the steel work of the viaduct was taken down. The brick pillars and abutments survive to this day. This view, although taken in 1955, would have been the same as in 1937, although the embankment would have been tidier with no trees and bushes. Taken after a rain shower, this photo clearly shows many of the distant details of Penrhos sidings. 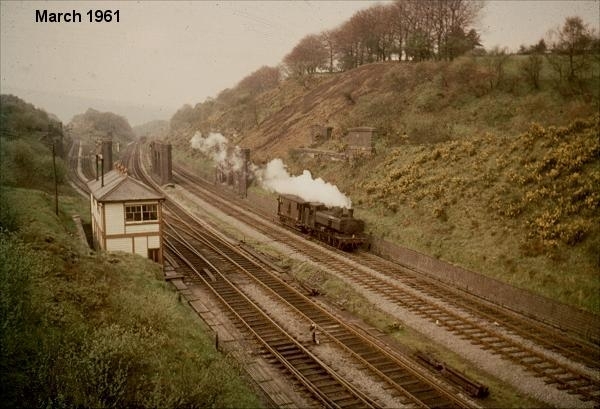 On the left is a freight train just leaving the sidings, whilst behind can be seen a rake of coal wagons in the sidings and the old water tower and loco stabling point. On the right in the distance is a pannier tank engine with auto-coach on its way to Pontypridd. Things were looking grim for Penrhos junctions by 1961 as a pannier tank hauls a lonely ex LMS brake van. Even grimmer by 1963 as the PC&N route has been singled and operated by token. The new token equipment and foot path across the tracks can be seen in front of the signal box. 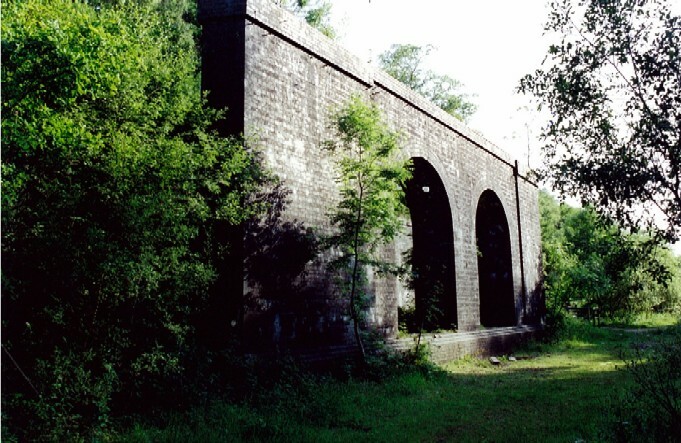 This photo, taken in August 2004, is looking from the southern end of the former Barry Railway viaduct, across towards the other side of the viaduct. The site has been allowed to return to nature so much that it is only possible to see two of the three piers and you wouldn't even guess that there is a abutment somewhere on the opposite embankment, less than 100 yards away. This photo, also taken in August 2004, shows the southern viaduct pier from ground level. Nature has only been kept at bay because a Sustrans cycle track and public footpath run in front of it. A ticket for a train that travelled through Penrhos junctions. 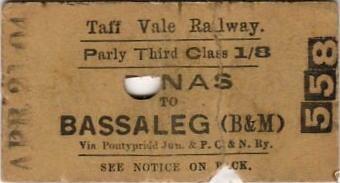 It is dated 21st April 1904 for travel from Dinas in the Taff valley to Basseleg, near Newport. Finally, another ticket for a train that travelled through Penrhos junctions. 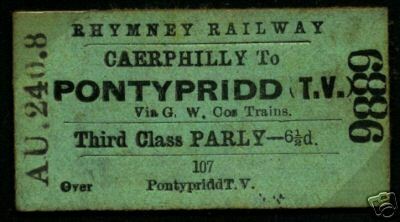 It is dated 24th August 1908 for travel from Caerphilly, just east of Penrhos, to Pontypridd at the northern end of the Pontypridd, Caerphilly and Newport Railway. But this ticket allowed the passenger to travel to the Taff Vale Railway station, which was just beyond the PC&N station and closer to the town centre. The ticket is for travel on GWR trains which ran from Newport to Pontypridd and was actually the only way to travel as a passenger beyond the PC&N station. 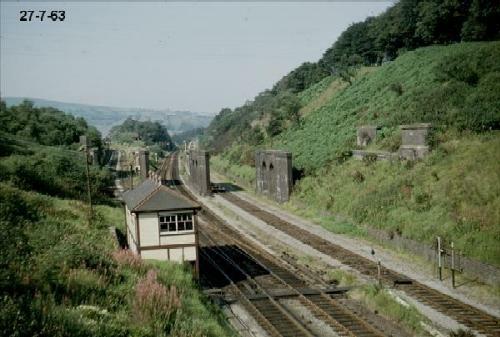 The Taff Vale Railway station was enlarged by the GWR and reduced by British Rail and still serves the people of Pontypridd.